1. For Mojo Sauce: In a medium saucepan, heat oil; sauté chilies and garlic for 1 minute, stirring frequently. Remove from heat. 2. Drain pears, reserving 3 tablespoons of the juice. Stir the reserved pear juice, lime juice and salt in to the sauce mixture. 3. Return pan to heat and bring mixture to boiling. Remove from heat; set aside. 5. Arrange salmon pieces on grill; brush with some of the Mojo sauce. Grill salmon five minutes, brushing again with sauce. 6. Add onion slices to the grill; turn salmon, and brush salmon and onion slices with Mojo sauce. Continue to grill for five to seven minutes more until salmon flakes easily with fork. 7. 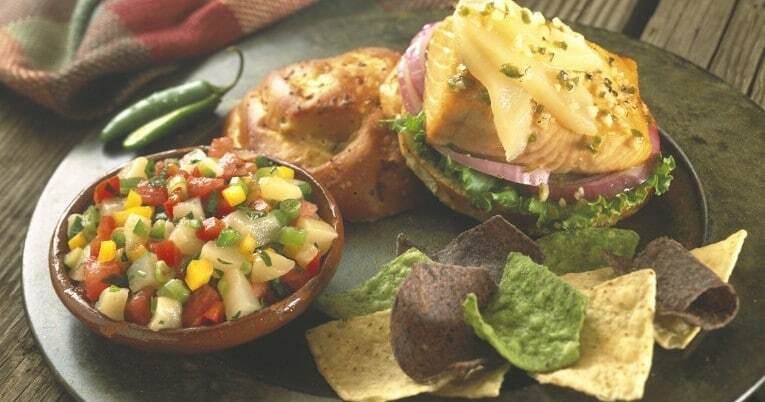 To Serve: Transfer salmon to toasted buns; top each burger with onion and sliced pears. Drizzle with additional Mojo sauce. Add bun tops and serve.